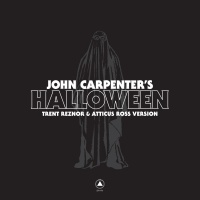 John Carpenter's Halloween is a single by Trent Reznor and Atticus Ross released digitally on Friday, 13 October, 2017. It is a cover version of the original theme, and is credited as "John Carpenter’s Halloween (Trent Reznor & Atticus Ross Version)". A limited edition vinyl version was released on October 26, 2018 on black vinyl and orange vinyl. The version featured on the original vinyl pressing features several differences when compared to the digital release. The piano is much sharper and less muted, some of the stringy sounding synth from the reprise of the main piano motif is missing, and the drum outro is completely gone and replaced with nary a sign of a beat at all. It's more implied by bouncing synthesizers than with any kind of percussion. WE SCREWED UP. The audio contained on the 12” pressing of Halloween released on Sacred Bones is a previous recording of the Trent Reznor & Atticus Ross version of the song, which differs from what was released digitally last year. A lacquer of the 'previous version' was cut and then scrapped, because Trent and Atticus decided that they could improve upon the recording. They went on to create the ‘definitive’ track that is available everywhere digitally. A MISTAKE WAS MADE when pressing the currently available 12”, and the ‘previous’ version was erroneously included. To correct this unforgivable error, we are reprinting the CORRECT version and will provide it to you free of charge. We are currently working on the repress. As of now, we are expecting these to ship in early 2019 and will update you soon on the delivery timeline. As a NIN.com customer, you do not need to take any additional steps to receive your replacement copy. The replacement offer includes those who purchased from other retailers. Customers may contact the point of purchase for information on how to obtain their replacement. This page was last modified on 8 November 2018, at 23:11. This page has been accessed 3,804 times.